Sometimes a song manages to succeed against all odds. As the sheet music for “The Man I Love” was on its way to production, it was unceremoniously dropped from the 1924 Broadway musical Lady, Be Good! The song was then included in Strike Up the Band (1927), which closed during its out-of-town tryouts. It was then slated for the Ziegfeld hit Rosalie (1928), a team effort by Sigmund Romberg, the Gershwins, and P.G. Wodehouse. Yet again the song was dropped before the show opened. Even a modestly successful 1930 revival of Strike Up the Band could not end the song’s streak of bad luck as the Gershwins agreed to drop it before the show opened. Despite such endless setbacks, the homeless composition had become popular in London and Paris as Lady Mountbatten, a Gershwin friend, had returned to Europe with a copy of the sheet music. Slower to catch on in the United States, the popularity of “The Man I Love” crested in 1928 with five recordings on the pop charts in the same year. A 1927 recording by Marion Harris led the way, entering the charts in March and rising to number four. “The Man I Love” was also the signature song for George Gershwin’s weekly CBS radio show, Music by Gershwin, which ran from 1934 to 1935. The ballad’s checkered past was not due to lack of appeal and it became one of Gershwin’s biggest hits despite the lack of a successful production association. The song’s problem stemmed more from the fact that it just didn’t fit in a lively musical. Standing alone “The Man I Love” was wonderful, but in a show it brought the action to a near standstill. As improvisational vehicles, many songs could not endure the transition from the loose Dixieland style of the “Roaring Twenties” to the smooth swing sound of the 1930’s. They were dropped from jazz musicians’ catalogs, performances and recordings and relegated to period collections and specialty bands. There are, however, a handful of songs written in the mid-twenties or earlier that have persisted as the topmost jazz standards: W.C. Handy’s “St. Louis Blues” (1914); George and Ira Gershwin’s “The Man I Love” (1924) and “Oh, Lady Be Good” (1924); and the Ken Casey, Maceo Pinkard, Ben Bernie composition “Sweet Georgia Brown” (1925). This section suggests definitive or otherwise significant recordings that will help jazz students get acquainted with “The Man I Love.” These recordings have been selected from the Jazz History and CD Recommendations sections. 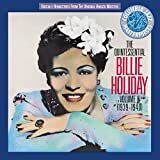 The place to start with “The Man I Love” is Billie Holiday’s compelling 1938 performance (The Quintessential Billie Holiday, Vol.8: 1939-1940). As for instrumental versions, a landmark moment occurred in 1943 for both the song and for saxophonist Coleman Hawkins. This Hawkins performance of “The Man I Love” (Ken Burns JAZZ Collection: Coleman Hawkins) features the saxophonist at his peak and is also significant for its role in signaling the arrival of the influential bassist Oscar Pettiford, who plays a short but forward-looking solo here. Tonality “A” is major; “B” is parallel minor. Movement The “A” motif is a step up and down, ending with a skip up a third, repeated over different harmonies and on different pitches. “B” starts out stepwise and then leaps up a sixth, followed by a step and a skip down and a step up. The initial chord progression descends step-wise in a unique way. The harmonic catalyst is when the initial I chord turns minor, becoming a ii7 of the chord below it (in the original key, Eb – Ebm7 – Db). The next two chord changes are common-tone ones, as the melody note–fifth scale degree–becomes the augmented fifth of the one that follows. The next chord changes require only the movement of the bass to become the “Neapolitan” chord of V7 (a “Neapolitan,” or N6, is a half-step higher than the chord it resolves to and is sometimes used as a substitute for the V7 chord). “B” is the old “I – II7– V7” progression, but in the minor, it is given a haunting, searching quality. The parallel minor here uses a common-tone, diminished chord to lead into the ii-V7 progression, returning the song to the original key. Recorded 15 years after its introduction, vocalist Billie Holiday’s 1939 version of this tune is a soulful performance, evoking an after-hours atmosphere. A highlight of this recording is the playing of her musical soulmate, Lester Young, and sometime Bing Crosby accompanist Joe Sullivan on piano. However, it’s Coleman Hawkins’ unique 1943 treatment that surprised the jazz world. Normally played as a ballad, Hawkins doubled the tempo for an extended romp. From the first chorus, by Eddie Heywood, the players eschew the melody in favor of improvisation. Hawkins, who had a keen ear for talent, utilizes young lions Oscar Pettiford on bass and Shelley Manne on drums to round out the rhythm section. The ideas flow endlessly on this relaxed, swinging performance. Young is accompanied by drummer Buddy Rich and, in a rare sideman appearance, pianist Nat “King” Cole. On this solo piano performance, Tatum takes “The Man I Love” at a medium tempo, and the underlying pulse is relaxed and swinging. Nonetheless, he manages to insert breathtaking runs that sound as if there are at least two pianists there. This track should be enlightening for those unaware of how modern Williams’ playing was. Her take on “The Man I Love” is striking in its harmonic richness. On this slow-tempo performance we can hear Charles’ influential, soulful sound as well as his underrated straight-ahead jazz skills. His trio here includes the great bassist Oscar Pettiford. Miles gives us a lyrical ballad performance with a group that also includes Milt Jackson and Thelonious Monk. Pianist Shirley is impossible to categorize because he incorporates classical, jazz, spiritual, and folk styles into his playing. At last his work is being reissued on CD. Here he takes “The Man I Love” around the block with a solo opening and a duo with cello. Then he picks up the tempo with bass and finally gives it a full concert reading at breakneck speed with cello and bass. With Nelson Riddle’s arrangement, this rendition of the song is as close to perfection as one can get. Fitzgerald’s elegance does “The Man I Love”’ justice. Carter was a vocalist in a realm of her own when interpreting standards. She makes a narrative of “The Man I Love,”’ disregarding the melody at times and dragging out phrases to emphasize their story qualities. Several young musicians went through “The Carter School of Music,”’ and some of the graduates appear here: Benny Green (p), Winard Harper (d), Michael Bowie (b), with tenor saxophonist Don Braden. On an album which the Penguin Guide to Jazz on CD calls a “glorious sparring match with (Oscar) Peterson,”’ Sims proves again his limitless understanding of the Gershwin’s music. He revisits “The Man I Love”’ twenty years after making a recording of it that stood the jazz world on its ear.